While it may not require a trip to the hospital, involve a scalpel, or a doctor operating deep inside your body, hair transplant surgery is, in fact, surgery. While certainly not as invasive as many other surgical procedures, a hair transplant does involve incisions in the skin, though they are minimal. That means there is always the potential for scars to develop in the donor areas where hair is harvested for transplant. Fortunately, advancements in hair transplant technology and techniques have gone a long way towards minimizing the scarring that was more prevalent in older procedures. 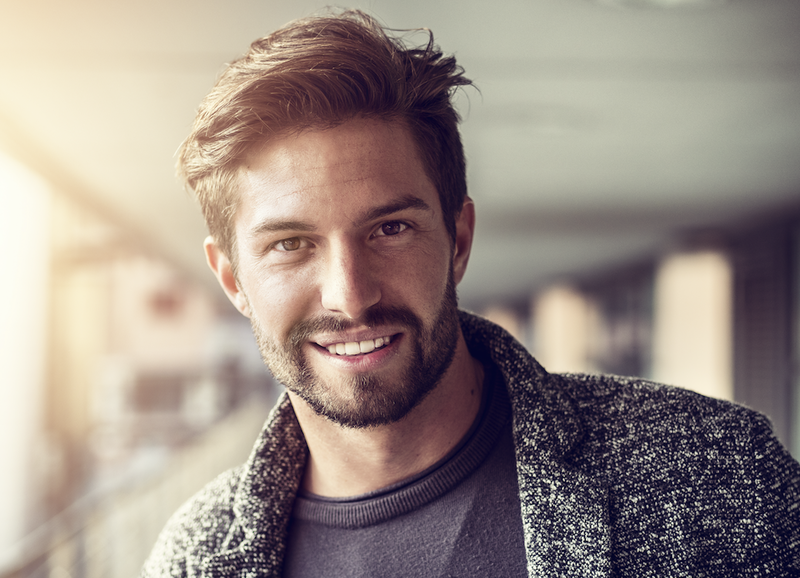 One of the many benefits of the Follicular Unit Extraction (FUE) hair transplant technique – developed and implemented by the Hair Transplant Institute of Miami’s Dr. Paul Rose – is that it results in minimal scarring. Nevertheless, scars can still develop depending on the patient’s natural healing capabilities or if a patient fails to take proper care of their scalp post-procedure. During an FUE transplant, we remove follicular units from the scalp one-by-one. Donor hairs are removed with a one-millimeter punch device, and the procedure is abetted with a head positioning device to minimize movement. With FUE, patients can completely avoid a more obvious linear scar often associated with other hair transplant methods. Instead, scarring occurs in a dot-like pattern and is virtually undetectable after healing and regrowth. The minimal scarring means that patients can wear their hair quite short (but not completely shaven) without any evidence that a procedure has been done. The most important step you can take to minimize or avoid visible scarring is to ensure that your hair transplant surgeon has the skill, technique, and experience to perform an FUE transplant with the precision needed to prevent scarring. Precision is the key to a successful FUE procedure, and the key to precision is experience and the skillful use of the most advanced technology available. Dr. Rose was one of the originators of the FUE technique, performing the procedure on thousands of patients since 2004. 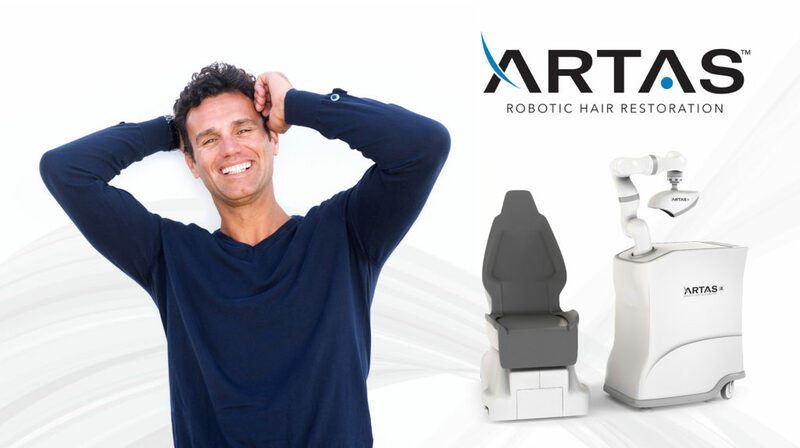 Our approach utilizes the image-guided robotics of the ARTAS system, which provides unmatched precision in hair transplantation. Though scarring should be minimal and heal quickly, you’ll want to be gentle with your scalp and hair after surgery to keep it that way. 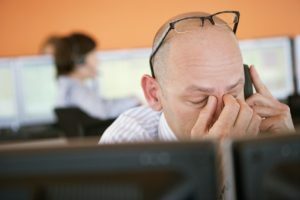 You’ll be able to return to work and engage in your regular activities in a matter of days, but for the first few nights, try to sleep with your head elevated. Wait a few days before shampooing as you usually would, but don’t be too vigorous when doing so. If you are concerned about your hair loss and are ready to do something about it, we invite you to schedule an evaluation at the Hair Institute of Miami. Drs. 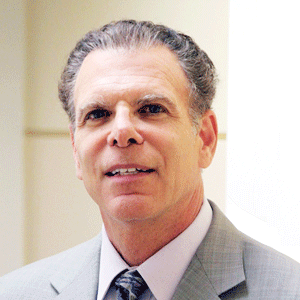 Nusbaum and Rose are internationally acclaimed hair restoration surgeons with more than 40 years of combined experience. To receive a personalized evaluation and treatment plan, contact us online or call our office directly at 305-925-0222. The world’s best hair transplant surgeons (like our very own Drs. Nusbaum and Rose) use their experience, skill, and advanced technology to transform balding or thinning areas of the scalp into full, robust, and youthful heads of hair. When you go home from the Hair Transplant Institute of Miami after your procedure, your transplanted hair will go with you, but your hair transplant surgeon will not. While your surgeon has positioned you, your scalp, and your transplanted follicles for success, ensuring that you get the best results from your transplant after you return home falls largely on your shoulders. Proper maintenance after hair transplant surgery is a critical part of your hair restoration journey; you need to “stick the landing” if you want your new hair to truly grow and thrive. Here are some key tips for maintaining your hair and scalp after your surgery. The day after the procedure, return to our offices to have the transplanted areas checked and shampooed. Wait at least 24 hours before washing your hair after that, you’ll be able to shower and wash your hair regularly, but during the first 7-10 days, in particular, you will need to do so gently and carefully to avoid damage to the fragile and newly transplanted follicles. Use gentle water pressure and cooler water than you otherwise would and avoid rubbing or intense lathering when shampooing. Avoid brushing your hair for as long as possible after you shower, don’t use hot styling tools for at least one week, stay away from tight clips or bands, and instead of rubbing your hair to dry it, apply light pressure. The Follicular Unit Extraction (FUE) technique we use spares patients from the visible, linear scars associated with traditional transplant procedures, but you will still have small hair graft sites to care for. To avoid infection, don’t swim in pools or the ocean or spend time in a hot tub until healing is complete (about 14 days) as these waters are rife with bacteria and pollutants. Evan after you head back into the water, avoid diving for a while as the impact of your scalp hitting the water can cause strain and pull of the scalp and donor area. Avoid alcohol for at least three days after your procedure, as booze can act as a blood-thinner and inhibit the healing process. Avoid spicy food for at least a week. Your body’s reaction to spicy foods diverts energy and resources which would otherwise be used for healing and repairs. Do not jog, cycle or lift weights during the first three days after surgery. Strenuous exercise or heavy lifting should also be avoided for at least a week. Sleep with your head elevated for the first few days to prevent forehead swelling. Of course, you should also religiously follow any specific post-surgical directions your doctor gives you, including taking any medication as prescribed. By taking care of your hair in the days and weeks after your hair transplant surgery, you will have the hair you’ve wanted for years to come. To receive a personalized hair loss evaluation and treatment plan at the Hair Transplant Institute of Miami, contact us online or call our office directly at 305-925-0222. The January/February 2017 print edition of Hair Transplant Forum International (ISHRS) includes a study on FUE/FIT harvesting methods, courtesy of Dr. Paul Rose. As outlined in the study, transection can occur when using the FUE/FIT technique if physicians do not accommodate for hair growth variances underneath the skin’s surface. Approximately 60 percent of transected hairs actually regrow, so avoiding transection allows for optimal FUE hair transplant results. Check out the full study in detail below. This article has been condensed for clarity. To download the original version with references, click here. The FUE FIT (follicular unit extraction/follicular isolation technique) procedure continues to gain acceptance as a method for harvesting donor grafts. The procedure is based on removing follicular units (FUs) or portions of FUs to use as grafts. A manual punch, mechanized punch or robotic device is used to remove the FUs. 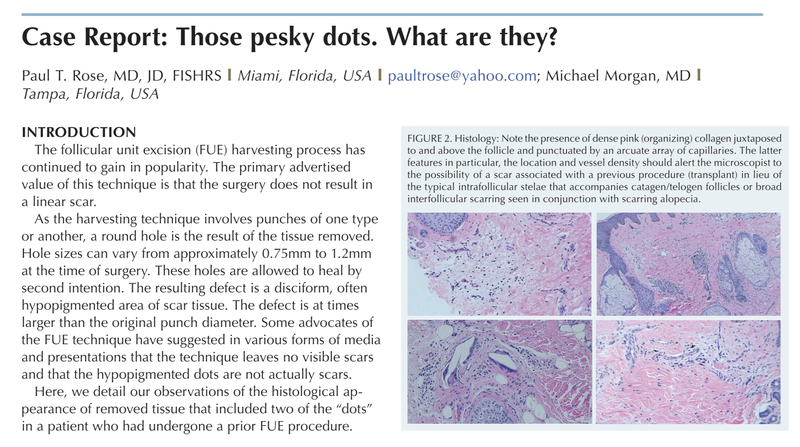 No matter which method of harvesting is selected, there is concern regarding recovering intact FUs and avoiding transection of hair follicles. A common approach is to align the opening of the punch used with the path of the trimmed hair follicles of an FU and dissect along this path. While some hair follicles under the skin may follow the angle above the skin, others may not, which can lead to greater transection rates. Hair follicles within dissected slivers were examined from 13 patients. The internal and external hair growth angles of over 300 follicles were examined. Below, we examine the approach to harvesting and the means to decrease transection rates by understanding the path of hair follicles within the skin and as they emerge from the skin. FUE is a method for harvesting donor hair for hair replacement. The technique is based on using a punch, whether by hand or mechanized device, to remove FUs or intact hairs from portions of FUs. 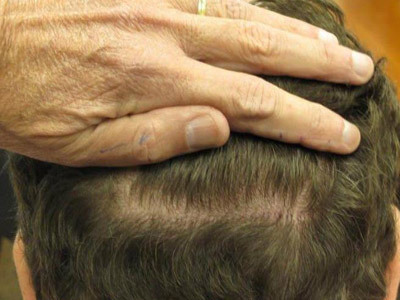 Problems that can occur with the FUE/FIT technique include capping, topping, buried grafts, and adhesion of grafts that can make removal difficult. The most important problem, however, is transection, which may result in hairs that do not grow. Although some physicians feel that large numbers of transected hairs that remain in the donor area may re-grow, extensive studies on this are lacking. Devroye demonstrated that approximately 60% of transected hairs regrew after FUE removal from the donor area. To perform FUE, the punch opening is usually aligned with the visible hair direction at the skin surface. Pursuing the incision along this apparent course of the hair may be misleading and result in transection. The reason for this is that, in many instances, the hairs within the FU exit the skin surface at a different angle than the internal course of the hairs within the dermis and subcutaneous tissue. In this study, we looked at the variability of hair exit angle from the skin surface as opposed to the internal angle within the skin. We also reviewed the trigonometry of hair angulation and a means on deciding punch diameter to try to ensure complete removal of FUs and minimize transection. The donor area of each patient was marked and anesthetized with 1% xylocaine with epinephrine. After anesthesia, a No. 10 scalpel blade was used to incise the skin to the dermal subcutaneous interface. No tumescence was used. A second parallel incision was made to create a full-thickness “strip” of tissue. The tissue was elevated and removed (Figure 1). Sections of tissue were removed from the center occipital and the lateral aspects of the strip. Slivers were created from this tissue and photographed. The photographs were reproduced and enlarged. The angle of the hair resulting from the path inside the tissue as opposed to the exit angle above the skin was measured with a protractor (Figures 2 and 3). The data was collected to determine the average angle and range of angles evident in the specimens examined. In this study, 310 hairs, from 13 patients, were examined within the slivers obtained. It was noted that the hairs within an FU often crossed or splayed away from each other. In addition, a greater change in angles was noted with curly or wavy hair. The average angle change (external vs. internal) was 6.43°, which included straight and curly hair. Curly hairs were considered to be hairs that exhibited a prominent curvature creating almost a “C” or a reverse “C” shape. The average angle change with only curly hair was 14.65°, however, sometimes a “curly” hair could be found amongst straighter hairs (Figure 4). In our study, the greatest angle change was 31° for straight hair and 35° for curly hair. In trying to ascertain a means to ensure less transection, we also looked at the trigonometric relationship between the punch size, approach angle, and the skin that would be required to obtain the full FU while decreasing transection. Where ” D” is the diameter of the punch, “0 ” (theta) is the change in angle of the follicle below the surface of the skin, “Y” is the depth of the punch insertion, and “X” is the lateral offset of the follicle bulb. Using the relationship tan (“0” theta) = X/ Y, it is apparent that d/2 is > X. For example, if theta is equal to 6°, and Y equals 4mm, then X = 4 tan (6) = 0.42. Therefore, if the punch size D is 1mm, then there should be little or no damage to the follicles in that FU. On the other hand, if the punch is 0.75mm, there is a significantly greater likelihood of damage to hair follicles. This assumes a depth of insertion beyond the epidermis and into the papillary dermis. An important question is: What is the maximal curvature of the follicle that can be accommodated by a given punch? What is the maximum theta? For example, if y = 4, then x = d/2 (maximum allowed) and the punch size (D) is 1mm, what is theta? To determine theta, theta = tan x/y == tan (0.5) /4 = 7.1°. FUE/FIT is a technique for harvesting grafts that requires understanding of the relationship of the path of hair within the skin with the exit angle of the hair(s) from the skin. As this study demonstrated, the course of hair in the skin can differ dramatically from the exit pathway. Often, the hair exit angle from the skin is actually more acute than the path inside the skin. Failure to recognize this and make appropriate adjustments with the punch can result in high transection rates. A modification of the surgical technique to consider is to raise or lift the punch slightly a few degrees more perpendicular after the initial entry into the skin. This motion may allow the surgeon to compensate for the typical change in angle that occurs when going from skin surface, through the epidermis, and into the fat. The angle change is usually less acute than it appears on the skin surface. The use of a blunt punch may provide an added measure of safety in terms of avoiding transection. This study demonstrated that hairs within the same FU can travel in very different routes and at times even curve back­ wards. This can create problems, especially with patients with very wavy or curly hair. While this study provided important information for an approach to harvesting using FUE/FIT, there are several deficiencies. The study was not done in vivo and the skin was anesthetized prior to removal. The anesthesia may have altered the hair angle in the sliver examined. Anecdotally, we noted that when saline was injected into the tissue prior to sliver creation, the hair angles could be altered. Saline injection in the dermis caused the hair to rise in a less acute angle. Similarly, saline injected into the fat also caused elevation of hair exit angle in the fat but to a lesser extent. Some physicians feel that tumescing the dermis prior to harvesting can allow for an easier alignment of hair in the FUE punch. Other physicians advocate not using tumescence. Exerting external traction upward on the donor area to diminish the change in angle between the skin exit angle and the internal hair angle may also help. Additionally, the use of a shallow incision with a sharp punch has been used by some surgeons. The use of a shallow incision followed by subsequent use of a blunt punch as described by Harris can be an alternative approach to harvesting. A robotic system (ARTAS® Restoration Robotics, San Jose, California, USA) employs an initial sharp superficial dissection accompanied by the almost simultaneous use of a blunt punch to core out FUs to lower transection rates. Many other drills and punches have come onto the market developed by surgeons such as Cole, Rassman, Devroye, Park, and Boaventura that are purported to lower transection rates. The use of the FUE/FIT donor harvesting method is becoming more popular. When using FUE/FIT, it is necessary to properly assess the hair angle in the skin and the angle upon exiting the skin to ensure limited follicle transection. This study shows that hair exit angle can vary significantly from the internal angle and the deviation is greater for curly or wavy hair. Acknowledgment: Thank you to Dr. Mohan Bodduluri for his assistance in preparing the article. The unwelcome feelings of stress and anxiety creep up when you least expect them. While intermittent feelings of worry are relatively normal, damaging stress levels are on the rise. These feelings of despair and anguish sometimes provoke thinning or shedding on the scalp. Stress-induced hair loss, called telogen effluvium (TE), can be short-lived or long lasting. Thinning or shedding inadvertently caused by anxiety and trauma is not only frustrating, but worrisome. In addition, trichotillomania is a less common but very serious hair loss condition perpetuated by stress. Unlike TE, patients suffering from trichotillomania actively pull hairs out habitually when facing stress and anxiety to cope. TE Scenario 1: Environmental factors shock the hair follicle into a resting state. Because the follicles are not actively producing more hair to replace ordinary shedding, patients see diffuse patterns of thinning on the scalp. The effects of environmental “shock” show up two to three months after a major life event. Depending on the duration of the event, follicles can return to their normal healthy state without surgical intervention. Patients usually see their condition clear up in less than six months with full regrowth. TE Scenario 2: Hair follicles enter their resting state as normal but do not regenerate properly, resulting in gradual hair loss. Rather than return to the anagen phase of hair growth, the follicles remain in the telogen state for prolonged periods of time. Thus, fewer anagen, or active, hair follicles are available. Because this scenario is prolonged, patients may not see immediate thinning. This is more common in individuals with chronic anxiety conditions. Many short-term hair loss cases are considered normal. For instance, many women experience short-term hair loss after giving birth due to fluctuating hormone levels – a condition called postpartum alopecia. Most women regrow their hair normally a few months later. Certain vaccines, antidepressants, extremely low-calorie diets and physical trauma are also common environemntal triggers of TE. Chronic illness, particularly chronic stress and nutritional deficiencies, are alternative instigators. Research shows a link between tension, hair follicle biochemistry changes and increased resting (telogen) hair follicles. Luckily, treatments for telogen effluvium are available. Assuming your hair loss is stress-induced, regular exercise, therapy and meditation can help. When a specific cause is not determined and stress relief does not reverse telogen effluvium, doctors resort to treatments such as low-level laser therapy (LLLT). In cases where stress-induced hair loss transforms into an enduring condition, many patients turn to hair loss surgery. At the Hair Institute of Miami, we welcome patients suffering from stress-induced hair loss to undergo a comprehensive evaluation. Our treatment plans include low-level laser therapy (LLLT) caps and advanced follicular unit transplant (FUE) procedures. Either alone or in conjunction with one another, LLLT and FUE helps patients suffering from lingering telogen effluvium regain their confidence and sense of well-being. Call us today at 305-925-0222 to schedule your personalized hair loss consultation in Miami. 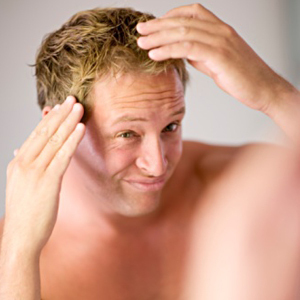 When hair transplant surgeries were first introduced, scarring was fairly common. Although an unwanted side effect of the procedure, many patients opted to undergo the surgery despite potential markings. Fortunately, modern technology allows hair transplant physicians to minimize the appearance of hair transplant scars today – allowing patients to see the results they desire. Because the ultimate goal of hair transplant surgery is to surgically recreate a naturally full head of hair, we strategically implement advanced practices that minimize scarring for optimal results. And, with new inventions and procedures being innovated, we can hope that one day, scarless hair transplants will become a reality. Despite how far we’ve come in the last 60 plus years since the first official hair transplant surgery was performed, we cannot completely eliminate scars – yet. Despite these limitations, the Hair Transplant Institute of Miami employs some of the most advanced methods that are as close to scarless hair transplants as you can get. Our Mosaic® Hair Restoration technique allows for the most precise and natural-looking outcome. First, our surgeons gather data on your follicular arrangement. We then use said data to design the implantation as it would innately occur. By designing the recipient area on the scalp to match the unique follicular pattern of each patient, we can create a fuller head of hair that mimics your biological makeup. The Follicular Isolation Technique (FIT) – or Follicular Unit Extraction (FUE) – was developed and implemented by our very own Dr. Paul Rose. Using the FIT method, we remove follicular units one-by-one. Donor hairs are removed with a one-millimeter punch device and the procedure is abetted with a head positioning device to minimize movement. With FIT, patients can completely avoid a more obvious linear scar. Instead, scarring occurs in a dot-like pattern and is virtually undetectable after healing and regrowth. With this method, we see patients benefit from faster healing times and the ability to wear short hairstyles confidently. Patients with limited donor hairs are prime candidates as well. Our Follicular Unit Grafting (FUG) procedure is similar to the more traditional hair transplant method, with a twist. Our physicians remove the follicular units at once in what is referred to as “single-strip harvesting.” This allows us to remove the units without damaging them to ensure maximum growth. The LEDGE closure technique, developed by Dr. Rose, allows us to minimize the linear scar of a single-strip transplant. Instead of executing a two layer closer, we use a single layer closure to lessen the tension and scar tissue buildup. 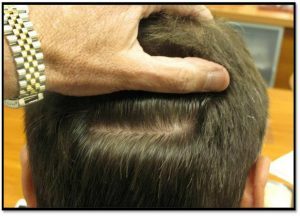 Patients who undergo the LEDGE closure technique can grow hair through the donor area to conceal the light surgical scar. In addition, we use microscopic dissection to subdivide the follicular units under a microscope. This process has been shown to increase follicular units and hairs by up to 25 percent compared to non-microscopic techniques. While completely scarless hair transplants have yet to be achieved, they are no longer the obvious surgeries from the past. Instead, you can achieve a fuller head of hair without the sometimes embarrassing signs of surgery. To find out if you’re a hair transplant candidate, schedule a consultation with the Hair Transplant Institute of Miami online or by phone at 305-925-0222.